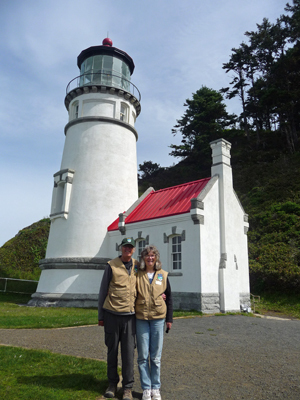 We had a wonderful time camp hosting at Heceta Head Lighthouse on the Oregon Coast during the month of May 2015. 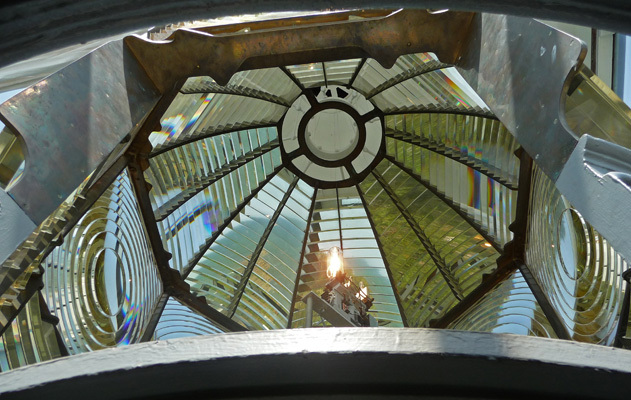 We knew next to nothing about lighthouses when we started and fell in love with the lighthouse and its Fresnel lens during our month of giving tours. If you enjoy giving an informative tour of a beautiful place then being a lighthouse tour guide at Heceta Head may be for you. This was our first hosting experience even though we'd been full-timers for 11 months. The previous summer we spent time interviewing hosts as we traveled and all the people who worked for the Oregon State Parks seemed to be happy and to enjoy what they were doing. So we had applied for camp hosts positions in the fall and the first position we got an availability notice about was Heceta Head (in early Decemeber 2014). They were booked up already for September (historically the best month weather-wise on the Oregon Coast) so we took a spot in May figuring that while it might be wet it wouldn't be horribly busy and for us this was a great choice. We were incredibly lucky weather wise. Our first two weeks, it was mostly sunny (though still in the mid 50's most days) and we had very little rain the whole month. Clearly buying a new pair of rain pants worked--I never had to use them. We had foggy days with a heavy mist but we didn't get of any big rain storms and none of the legendary horizontal rain that you can have in October through April. Walter did wear his silk long john pants every day but then he really doesn't have much body fat to keep him warm. I usually wore my jeans, a t-shirt, a medium weight fleece and my raincoat with my host vest over it. About a quarter of the time it was warm enough to shed my raincoat and twice I abandoned my fleece and just wore my t-shirt and host vest. We received no forms to fill out or information about the lighthouse before we arrived. While it might be nice to study up on the place before you arrive that's not expected or encouraged for that matter. We arrived on April 30th and our campsite at Carl G Washburne State Park campground was marked with our name. They had selected a spot that was JUST big enough for our truck and trailer. As we were setting up camp, Deb, the ranger in charge of the lighthouse volunteers, came by and gave us a notebook. She told us to fill out the forms and read the materials that night. Training would be a 9 am at the office just up the road. And we were off and running. The forms took a while but we got them done and we were lucky enough to have 2 notebooks to start with since we had one for the hosts who were to park across from us and who weren't due to arrive until 6:30 pm. The materials provided were a bit overwhelming (and neither well written or well organized but chock full of information some of it contradictory since it's been paritally edited over the years) but there was one small guide that held everything you really needed to give a tour--whew. They provided two copies of that and we both went over it a couple of times that evening. I've written up our basic tour if you'd like to see it. The next morning we got 2 hours of training that included everything from safety, money handling, security (how to set the alarms and lock the doors), cleaning (at the end of the day) and how to handle the ticket system when the crowds get big. Then Walter and I drove on down to the lighthouse for our first work shift (11-3 that day). We each took a tour with one of the experienced hosts who were manning the lighthouse and then I dove right in a gave my first tour. After Walter had taken a couple of tours he was willing to give his first tour too. One of the things they don't always tell you about the assignment here is that your day includes a 3/8 of a mile hike from the beach parking lot up to the lighthouse (a 150 foot gain). It's a pretty hike up past the assisstant keepers house and around the corner to the lighthouse but even though we'd been hiking all winter we both needed to stop and catch our breath a time or two on the way up for the first week or so. By the end of the month we could really motor up it but the hike can be a deal breaker for folks with bad knees or hips or other health issues. The other issue for some folks is the stairs. 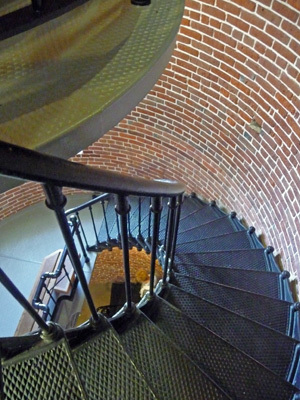 As a tour guide at Heceta Head you are expected to climb the 58 stairs in the lighthouse with each tour you give. On a busy day that can mean 6 to 7 trips up and down the stairs in a 3 hour shift. Some folks knees aren't up to that. I found that my lower back hurt the first couple of days because I didn't sit down for 3 plus hours. As long as I'd remember to sit down just for a couple of minutes every hour then I'd be okay. Standing out in the cold doesn't help things like that. For some folks the fact that there isn't much shelter from the rain is an issue. If it's raining you can always hang out in the little museum (oil house 2) where there's a bench to sit. But that only works if you're not busy. If it's busy then you'll be out greeting folks and you'll be in the rain or the fog or the mist as the case may be. A good raincoat is a must. We seemed to be busier on rainy weekdays than on sunny ones. We were both pretty darned tired by the time we got back to our trailer after the first day. We've been retired for a long time so a 7 hour day was a lot for us, especially after 2 travel days preceding it. We spent that evening re-reading the materials and then worked the next 2 days with the rest of the hosts. There were 7 of us on duty that first Saturday (working 11 to 3) and it was a gorgeous sunny day. We spent more time sitting on the bench in the sun than giving tours but we both still managed to give 4 tours a piece while the other new hosts mostly went along on the tours given by the experienced hosts. And thus completed our training. In other words, you learn as you go. Every day someone would ask a question I didn't know the answer to and thus I'd learn a little more when I went looking for the answer. No one expects you to know it all. You can carry the little info pamphlet and looking things up or just say you don't know. After a few days we were ready for more material so we took home one of the reference books available (one an old training manual and one a book on Heceta House, the assistant keepers house that is just down the hill from the lighthouse). Starting the first Monday in May we began having 2 work shifts. The morning shift worked 10:30 to 2 and the afternoon shift worked 2 to 5:30. In the morning, you open up all the buildings, put out the sign, make sure everything is clean, stock the brochures and sweep the rocks off the edges of the trails. With four of us this that got done in about 15 minutes and we'd be ready to give tours starting at about 10:45. The afternoon shift offers tours until 5:05 and then sweeps the oil house, vacuums the stairs and the entry of the lighthouse and locks up all the buildings. We were often done before 5:30 but sometimes we'd have a rush of folks right at 5 and not be done until 5:45 or so. The time you're expected to put in as part of your volunteer agreement includes your commute time so they have you keep track from the time you leave your rig until you return and the commute can take about 1/2 hour each way. We had 4 macho hosts who hiked each day from the campground to the lighthouse. That took them 1 1/2 hours each way! And then they worked their 3 1/2 hour shift on top of that. I could have done the hike both ways but not worked on top of it. The host couples (we had 5 couples and 4 singles) each worked one shift a day for 4 days on and 3 days off. Since we had a full compliment of 14 hosts (enough for 4 hosts on two shifts every day of the week) the singles also worked 4 days on and 3 days off. When they don't have as many hosts (which isn't uncommon) during the double shift season, the singles can be expected to work 5 days on with 2 days off to put in the 30 hours expected in their agreement to get their free camping spot. Most of us had a mixed schedule where we worked mornings some days and afternoons the others with a different pattern each week. A couple of folks worked just mornings or just afternoons. No matter what, our days off stayed the same. In our case, we had Monday, Tuesday and Wednesday off. We rarely saw staff. After the initial morning training we only saw Deb to speak to about 3 times the rest of the month. And that turned out to be just fine. She can be a bit temperamental (i.e. she gives lectures to folks about minor infractions of rules you didn't necessarily know existed) so it was just fine we didn't have a lot of contact with her. We had a number of very experienced hosts who had worked here for years and they could answer just about any of our questions. The campground hosts had been hosting there for nearly 10 years and they took very good care of all of the hosts and their questions. 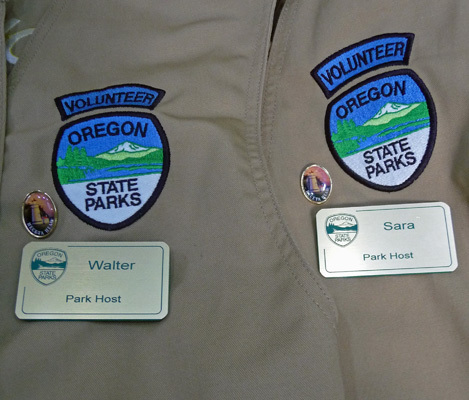 We got our Oregon State Parks Volunteer vests and hats the first day. But our name tags and parking passes didn't arrive until half way through the month. Some of the hosts who had worked at other sites had never gotten their name tags or their vests so I guess we were doing pretty good. The parking lot at the lighthouse requires a day use pass. So for the 2 weeks we didn't have one we simply wrote "Lighthouse Hosts" on one of the receipts for the parking fee and put it on our dashboard and all was good. The park allowed us to get our mail at the address for the office and the mail would show up in the registration booth at the campground usually by mid-morning on the day it arrived. Packages got delivered to the campground hosts and they made sure we got them the day they arrived. 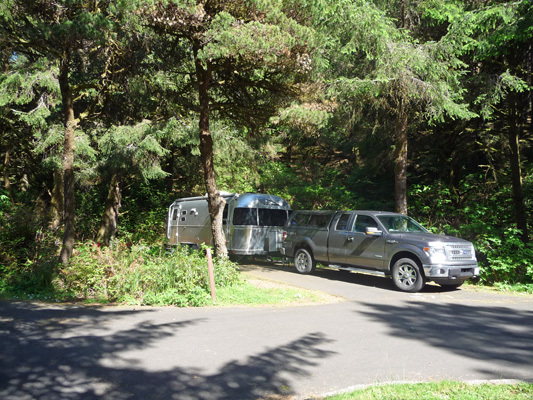 The campground is almost exactly halfway between the towns of Yachats and Florence. Some of the hosts tended to go to Yachats (it has some great restaurants and a library where you can get a card to check out books). We oriented to Florence because there is a nice Safeway, a Fred Meyer and a very nice True Value Hardware in town. The library has free wi-fi that works great too. Cell phone service at the campground is nonexistent and thus there is no internet either. If you go across the street to the Day Use Area there is a picnic table at the south end of the parking lot where most of the time you can get a good Verizon signal--we called this the phone booth. You can also get a Verizon signal up at the lighthouse (and sometimes in the parking lot at it's base). Some days however we had to go all the way to Florence to get a decent Verizon hot spot signal. Since Florence is 13 miles away that can be tedious and is a deal breaker for many. Our Sprint phones didn't get a signal until we got into Florence proper. But we're used to them not working outside of pretty good sized towns. There is one high capacity top loading washer and a dryer that is provided free to the hosts. It's in the A Loop bathroom building. There's a lending library for the hosts there too. We set up a sign-up sheet to use the laundry and there never seemed to be any problems with getting to use it. A number of the hosts had laundry in their rigs or lived nearby and went home on their days off and did laundry there. There are also lots of laundramats in Florence. May was a great month for whales. The gray whale migration is winding down in May but it includes mostly mothers and calves which makes it lots of fun. 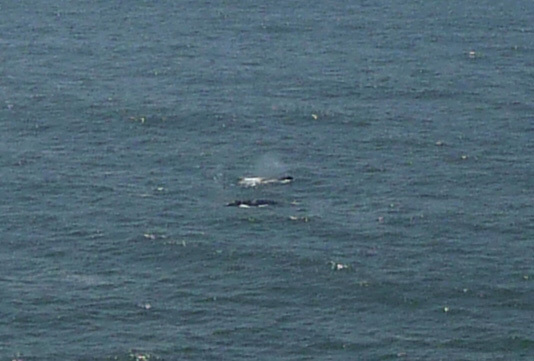 Most days we saw at least 2 to 4 whales during our work shifts. And there are lots of sea lions over across the bay. There was a shortage of birds this year but other years they have a large colony of common murres out on the rocks. The hiking in the park itself is great and there are lots of hikes in the area as well both to the north at Cape Perpetua and to the southeast out Salt Creek Falls Road. We just didn't have the time or energy to do them all. And if you want to visit another cool lighthouse you need only drive south to Reedsport to see the Umpqua River Lighthouse. The beach is across the road from the campground and so is over 1/2 a mile walk away. It's beautiful and sandy and goes on for miles. There are rarely people on it. But it is windy. And in May don't forget to check to see if the Darlingtonia are in bloom just north of Florence. Copyright Winterhaven Press 2015 All rights reserved.